Growing up in Elizabeth City, Nyla Harris would spend plenty of her time on the Elizabeth City State University campus. Her mother worked in Academic Affairs and Harris spent afternoons on the third floor of the Thorpe Administration building. Despite her exposure to ECSU, Harris, a sophomore, says she wasn’t sure she would attend her hometown university. Harris will one day leave ECSU, and when she does, she’ll do it with bars on her shoulders. 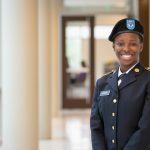 Harris, a member of the campus ROTC, looks forward to the day that she will be commissioned a second lieutenant in the United States Army. 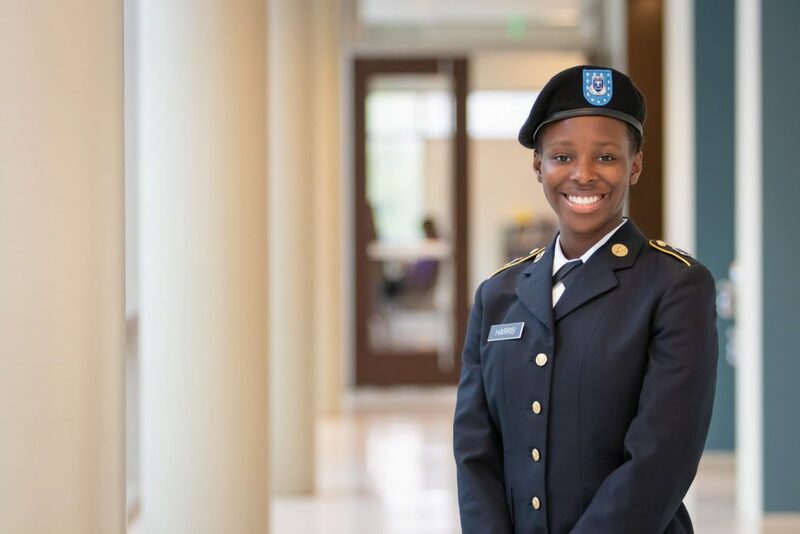 The biology (pre-dentistry) major will continue her professional studies while serving as an Army officer. She says she looks forward to one day becoming an orthodontist. Harris says the secret to life on campus is to get involved with life on campus. “Volunteer! Volunteer! And volunteer! As a freshman, students are required to complete service-learning hours in freshman seminar. The goal is to not only volunteer when it’s required of you, but to get in the habit of volunteering to experience the uplifting aspect of giving back to your community,” she said. And Harris is not shy about participating in campus life. If you ask her to list some of her highlights, Nyla Harris will give you a long list, including Chancellor’s Ambassador, tutor, Student Government Association, and a Thurgood Marshall College Fund Scholar. That last one allowed her to attend the Fund’s Thurgood Marshall Leadership Institute earlier this fall. “The conference taught me to ‘get in the box by thinking out of the box,’ and to definitely move outside of my comfort zone,” she said. Harris says she was able to talk with representatives and CEOs of Fortune 500 companies and meet with scholars from 46 other HBCUs across the country. “Next year, with more experience and networking skills, I will continue to build my network and strengthen my net worth and hope to bring a much larger group of Vikings along with me,” she said. Harris, who is also an Honors Program student, understands the value of ECSU. She recognizes its impact on her life, and encourages future students to take advantage of the family-oriented campus. Back to School Week! I love the feeling of freshly coming back on campus every school year. Upon graduation will be commissioned as a second lieutenant in the Army and continue my professional studies in dental school to work towards becoming an orthodontist. Take advantage of the opportunity in your community! Telecommunications/TV Station; I complete my work study in the TV station and it’s my favorite place to be. I love the atmosphere and always get my school work done along with the creative work and graphic design aspect I create for the school’s TV channel, W18BB. Dr. Mary-Lynn Chambers has encouraged me to seek out the world and not get comfortable with where I stand because, “The opportunities are endless for those who seek them.” Dr. Kenneth E. Jones has pushed me to go above and beyond what is expected of me in order to reach past my “maximum” potential. Finally, Dr. Gary Harmon, my advisor, has taught me the importance of making decisions and learning from them. Without the help of faculty and staff on campus, I wouldn’t have been half of the student that I am today. I appreciate their help very dearly. Don’t take on more than you can bear. College is the place to meet new people, join clubs and organizations that interest you, but never forget why you’re here. Your purpose is to complete your studies and earn your degree. Make a plan and execute. Easy to say but hard to maintain.